Results: Ten of us picked up 33 bags of trash, 4 bags recycling (kudos to Linda & Josh for separating), 7 tires on rims and assorted buckets, drums, coolers, etc. All in all about 1,400 lbs. Once again, we filled the dumpster at Fishing Headquarters to overflowing. I'm pleased to report that we made it all the way along this year, meeting Frank at a delightful spot along the water's edge not far from where you stopped. Not quite like Stanley & Livingstone, but very gratifying, none the less. Thanks to Linda for organizing and to everyone for participating. Pictures in reverse order: Unloading at Fishing HQ; Meeting in the middle along the shoreline; loading the ATV; Ed Farber hard at work; The Team starting out on a chilly morning: Frank Humbert; Pat Fasano; Peg O'Grady; Patrick Hodgson; Patty Blakeslee, Anders Alfelt, Linda Swank & Ed Farber. Invasives removal organized by Sarel Cousins, Wildlife Habitat Council and the West Nottingham Academy Green Team. 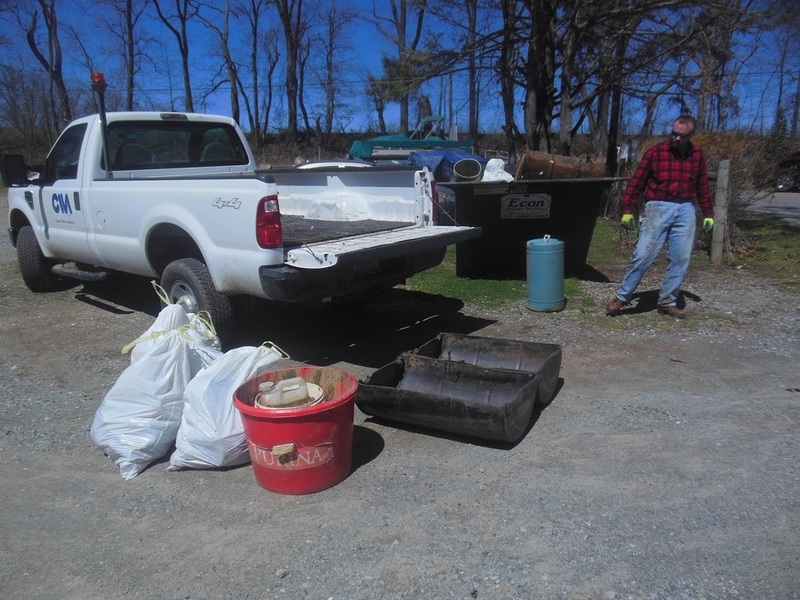 Trash pick-up along portions of Waibel & Firetower Roads organized by OWA. Results: 40 volunteers split into two groups. One group picked up 68 bags of trash, 3 tires and miscellaneous objects along 2.6 miles of county roads from West Nottingham Academy to Dr. Jack Road while the other group focused on invasives removal at Woodlawn, making a big dent in the tree-strangling vines, multiflora and garlic mustard. All completed in 2 1/2 hours! Thanks to Sarel for providing the venue and to all who participated. A special shout out to West Nottingham Academy for bringing two busloads of students to help.